Marks tags and neck tags with identification. Hand write numbers and/or letters on blank tags or supplemental data on already printed tags. 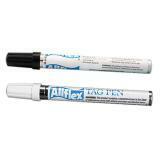 Writes well on: Z-Tags, Q-flex 1.5, 3 and 5, EasyTags, Button, MiniTags, Neck tags and X Tags. Push on tip until ink flows. A heavy ink deposit is necessary for a prolonged number life. Replace cap when not in use. Will not write on Q-flex 1.0, Swivel, Qwik or Snapp tags. Used for identification of sheep, goats and livestock guard dogs. Also can be used as luggage tags. Used for identification of cattle. Long neck enables easier reading in winter when animals have longer hair. Proven superior retention. Easy application. Helps prevent disease transfer. 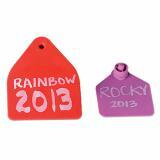 Tag of choice for adult-size cattle. Large flap makes it easier to read compared to smaller tags. Proven superior retention. Easy application. Helps prevent disease transfer. 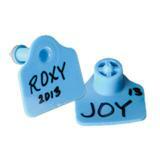 Reliable & writes neatly & clearly on the ear tags purchased at Premier. Would definitely buy again! They work great last a long time and don't fade. I love this pen! I use it to mark my collars on my sheep w/ their scrapie tag #, month/yr. born, & sire & dam. When I get inspected, the inspector does like to see the additional information. The pen marking lasts longer than the collar! Thank you Premier1!